The tempest over the location of the carrier USS Carl Vinson last week reminded those of us who covered the first Gulf War, way back in 1991, of the heat-seeking criticism that Saturday Night Livefired at the Pentagon press corps just before the invasion to drive Saddam Hussein’s forces from Kuwait. While the parallels aren’t exact between the SNL parody and the MIA Vinson, they’re worth exploring. A little misdirection can go a long way in international affairs. But the fact many in the national-security community, and the pundits that opine about it, view President Trump as a buffoon-in-chief makes it easy to spin the Vinson tale as one of inept confusion. It certainly has the hallmarks. But the press was a willing accomplice, busy turning hints and feints into a fait aircraft-carriercompli. 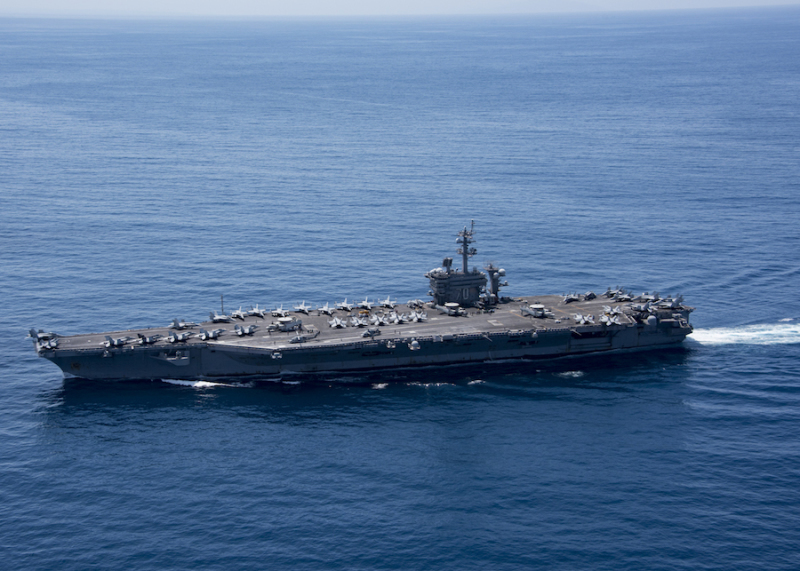 Carrier-battle groups don’t turn on a dime, or even a quarter. Both the Pentagon and the White House avoided precision when it came to charting the Vinson’s hour-by-hour movements. Nods and winks about the ship quickly cascaded into a misleading narrative concerning its whereabouts. The Pentagon’s Pacific Command said April 9 that the Vinson and her sister ships were scrapping a scheduled stop in Perth, Australia, and heading to the “Western Pacific”—an awfully big part of the world—from Singapore. But instead of heading north toward the Korean peninsula, it steamed south for a week of training. While the Navy’s official statement never said the carrier was heading directly toward North Korea, U.S. Pacific Command officials mentioned the growing tensions with Pyongyang and let reporters connect the dots. The brass helped. Two days after Pacific Command put out its initial statement, Defense Secretary Jim Mattis said, in response to a reporter’s question, that the Vinson was “on her way up there.” The questioner noted that the Vinson would arrive off Korea “in the coming weeks,” but that apparently got lost in the translation from English to English. The next day, Trump said “we’re sending an armada,” apparently oblivious that the British shredded the world’s most famous armada—that would be Spain’s—in 1588. Their comments ratcheted up tensions as North Korea readied to celebrate the 105th birthday of the late Kim Il-sung, grandpop of current dictator Kim Jong-un. Western intelligence agencies predicted North Korea might test a nuclear weapon, or conduct a missile test to honor its founder; it launched a dud on April 16. If the Pentagon were trying to mislead, it blew it, big time, on April 17 when the Navy posted a photograph of the Vinson taken two days earlier in the Sundra Strait. That’s more than 3,000 miles from North Korea, between the Indonesian islands of Java and Sumatra. Christopher P. Cavas, a reporter for Defense News, an independent newspaper that covers the U.S. military, found this enlightening. He added 2+2, and—Surprise!—got 4. As you can imagine, the press didn’t care for any notion that it had been hoodwinked by the Pentagon, or was guilty of sloppy reporting. Pundits said the missing carrier signaled everything from kinks in the sacrosanct chain of command to a Navy just a little too eager to show its stuff. “Mr. Trump broadcast a show of force to underscore the power of an American deterrent, but the lesson is that it’s dangerous for Presidents to sell a military mirage,” the Wall Street Journal thundered in an editorial last Thursday. “Go find your boats,” Gail Collins said in her New York Times column. Information is power, and no one has a right to know the precise location of American warships sailing on the high seas. Many argued it was the U.S. government’s role to correct the misimpression. But why? Information is power, and no one has a right to know the precise location of American warships sailing on the high seas. Military deception is such a key part of defense strategy that it even has its own acronym—MILDEC. The Joint Chiefs’ official 2012 Military Deception manual—they have a manual for everything, except winning wars—embraces deception, with caveats. “Care should be taken to protect the quality of information available for friendly decisions and public dissemination,” it says, lest the Pentagon’s PR strategy becomes “part of any MILDEC action and lose the public’s trust.” Whoops! But the impression of what the Navy likes to call “4-and-a-half-acres of sovereign U.S. territory”—that would be the flight deck of a Nimitz-class carrier like the Vinson—steaming toward the Sea of Japan at flank speed might help stay the hand of someone like Kim Jong-un. It could distract him and his military while minimizing the risk of escalation. Indeed, the press in South Korea, Japan and the U.S. all gave heavy play to the Vinson steaming toward a showdown with Pyongyang. It made for great copy, even though the Air Force bombers already on station in South Korea, Japan and Guam would have been more useful against North Korean targets. But they were already in the neighborhood. No drama there! The press—all the press, but especially the always-buzzing arsonists of 24/7 cable news—spied the spark triggered by the Navy’s announcement, tossed gasoline on it, and then called in the fire alarm. The Pentagon, always leery of being spanked by the White House, quickly committed ritual rhetorical hari-kari for its sin. “We communicated this badly,” one defense official told the Wall Street Journal. Similar mea culpas echoed in other media outlets, showing that a chagrined Pentagon had learned its lesson. Except for one thing. What’s amazing is that the press, hoodwinked as it was by the Pentagon’s fakery, was so eager to gobble up the morning-after line that it was all an innocent snafu, wrought by miscommunication and confusion.